Five minutes is all you need for these low-fat baked doughnuts. There’s no yeast and no rolling and definitely no need for a special pan. Ready in as little as 15-minutes from the oven. 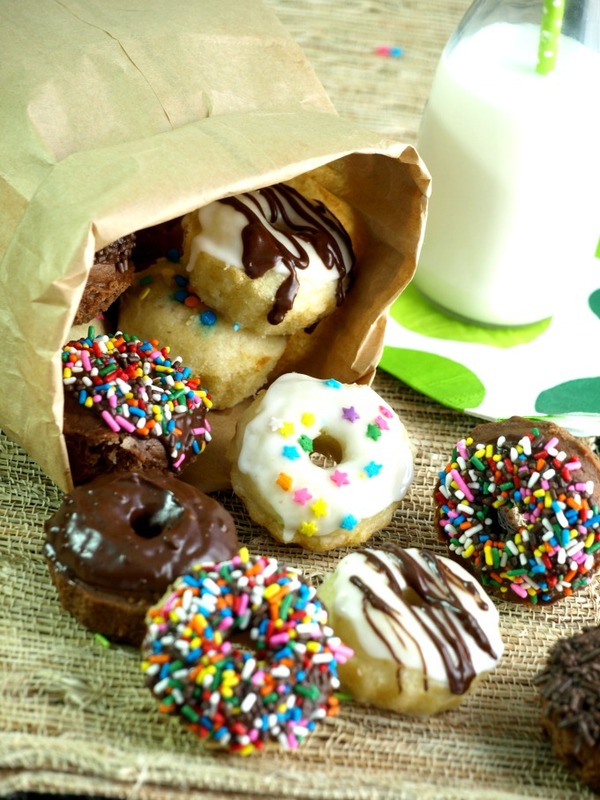 Like most kids, my kids love doughnuts and who wouldn’t, after all, they are pretty tasty! They are also getting SO expensive at the local doughnut shop. So I wanted to make some at home that I could bake rather than fry. However, the rolled versions we’ve seen are pretty tedious and take a few hours of pre-planning to get the dough made and rested before they can ultimately be rolled and head into the oven. I never have that kind of time these days… or forethought. These doughnuts are made of a quick and easy cake batter version and would suggest the need for a special “mini doughnut pan” but instead I went in search of something I already owned that would deliver the same end result. I found that I could use my mini bundt pan, a mini muffin pan or even a cake pop pan (think doughnut holes) to achieve the same results without buying yet another specialty pan to add to my growing collection of kitchenware. So if you don’t have a mini doughnut pan, I strongly urge you to just improvise. Five minutes is all you need for these baked doughnuts. There’s no yeast and no rolling and definitely no need for a special pan. Prepare the mini muffin cups, mini bundt pan cups or mini doughnut pan with non stick cooking spray. Place all the ingredients for the doughnut batter into a large bowl and mix to combine. The batter will be wet like a cake batter. Spoon the batter into a gallon sized zip-top bag. I do this by holding one bottom corner of the bag in my hand like a cone and then folding the rest of the bag over the op of my hand to form a large opening. This keeps the batter into one end of the bag for ease of use. Cut a small hole across the corner of the bag that you loaded the batter into about 1/2 inch for the bottom corner. Squeeze the dough into the prepared pans filling no more than 2/3 full. Bake for 8 to 10 minutes or until a toothpick inserted into the doughnuts comes out clean. Transfer to a wire rack and cool completely before glazing or frosting. To prepare the glaze, combine the powdered sugar, water and vanilla and whisk until smooth. Dip one side of the doughnut into the glaze. Place the doughnut, glazed side up, on a wire rack and immediately add sprinkles over the glaze, if desired. Repeat as desired with remaining doughnuts. My batter is runny and just blends together in the mini muffin tray. Help? Do you cut holes after baking? It’s meant to be a loose batter. Using the mini muffin tin would make doughnut “hole” type doughnuts. The doughnuts in the photos were made with a mini bundt pan which is why they have holes in the center and fluted edges along the bottom. Hope this helps. What a great idea to use a tiny bundt pan. I loved these and the kids loved the sprinkles. Have these a try. They are light and fluffy and very tasty. Love this idea and the use of pans I already have instead of buying yet another baking pan. Hi Rose, I could not agree with you more! Thank for taking the time to comment. It means the world to me to hear from you! Lower in fat and baked? Yes, please! They are pretty tasty indeed. Loving the low cal Mini donuts. I’m going to make these for my partner this weekend. I know we’ll enjoy them! My daughter loves the sprinkle ones the best. I like the chocolate! Love, love baked donuts, especially nice and easy ones like these! Great idea to use a mini bundt pan too – i have a regular donut pan but not a mini one, will have to try this. They look yummy! Thanks, Michelle. These are super simple to make and so yummy too.